I'm not a huge fan of chocolate cake, neither is the rest of my family. For us chocolate cake is for birthdays only. 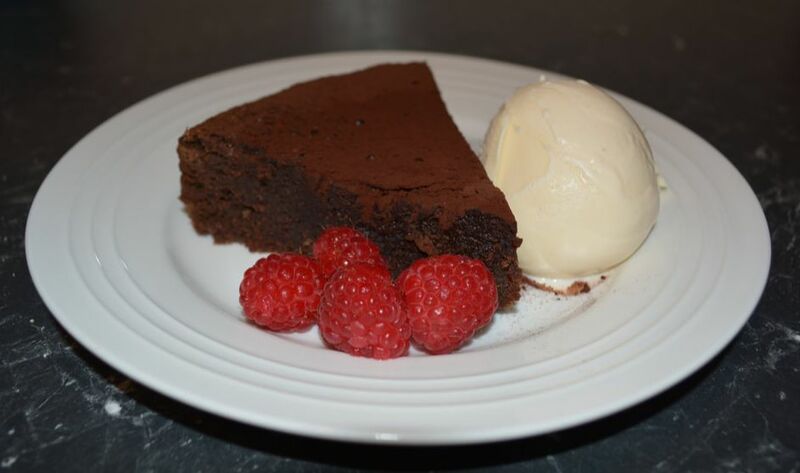 It is not that we don't like chocolate cake, we just prefer fruit based desserts, pies etc. However, after just saying that, this cake I have to say I would make again and again. I really love this one. What I love is that it isn't too sweet or too rich. What I love is that it is chocolatey, it is fudgy, it is simple to make, it is YUM! I have finally found a chocolate cake that I can serve after dinner to my guests that looks impressive, tastes great and isn't too heavy. Can I also say it is made with simple pantry items. So if unexpected guests are coming, this is one of those cakes you can make quickly, minimum mess, and you have something to serve with coffee. Lately I have tried a few Donna Hay recipes, and I have to say I'm loving her stuff. My friend Sandra got me to try this one, she loved it, so I thought I have to try it. I have since given it to a few friends to try and it has been a hit with everyone. I like it with ice cream and berries on the side, but it is nice even on its own. 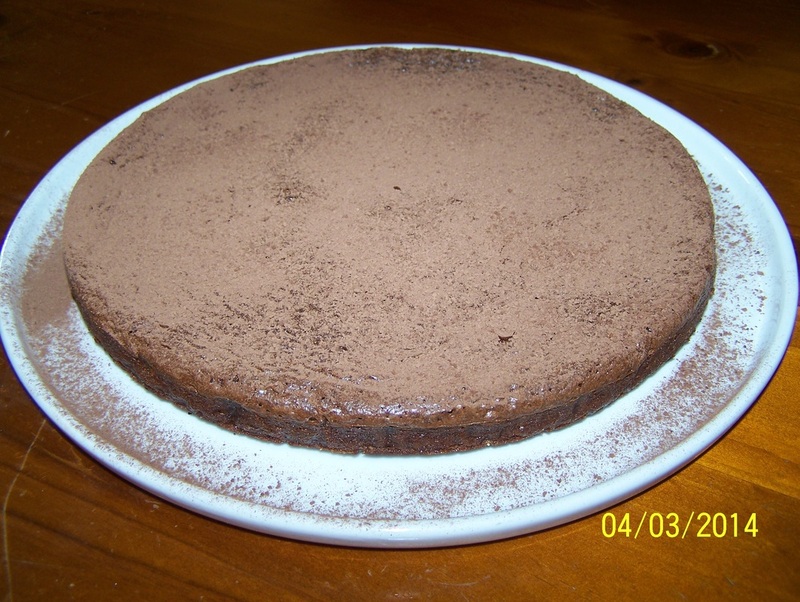 It really is one of the best chocolate cakes I have ever tried or made. Line the base of a 22cm springform pan with baking paper. Spray the sides with some cooking oil, then line the sides also, making sure the paper goes higher than the tin by a 2cm. Preheat your oven to 170C/150C fan forced. To a large heatproof bowl, add the butter and chocolate. Place the bowl over a small saucepan of simmering water. Stir until nearly all melted, then you can take it off the heat, continue stirring until all the butter and chocolate has melted completely. Add in the brown sugar, flour, milk and almond meal. With a spoon give it a quick mix (it will not be smooth at this stage as it is too thick). Add in the eggs, stir until you get a lovely smooth cake mix and all the egg has been incorporated. Pour into your prepared tin. Loosely cover the tin with aluminium foil-you put the foil over the extended baking paper. Bake for 40 minutes. (Now I have made this a few times, the first time it baked perfectly. Another time, I had used a smaller tin and after the 40 minutes it was still really wobbly/runny in the centre of the cake, in this situation bake it for 5 minutes longer, check it, if still wobbly, bake a further 5 minutes, in total I baked it for 20 minutes more. What it should be is set, not wobbly, but when you touch the centre of the cake it is soft, but not runny, don't let this note scare you, it really is easy to make). Once baked, uncover, allow to cool in the tin for 30 minutes, then refrigerate it in the tin for a minimum of 2 hours. Dust generously with cocoa. Serve with cream or ice cream and berries.